For whatever reason — hypocrisy, ruthless ambition, an allegiance to few but himself — Texas's Ted Cruz is one of the most reviled senators in the United States. Even though he's often a punch line for late-night comedians, Cruz was long seen as a safe bet for reelection in November. Was. Democratic congressman Beto O'Rourke, representing the El Paso area, is working like hell to unseat the former 2016 presidential candidate from the Senate. Lanky, energetic, and a youthful 45, O'Rourke is receiving Kennedy comparisons and glowing profiles (Politico: "Beto-mania sweeps Texas"), while he's outraising Cruz and promising polls put him a scant five percentage points behind him. O'Rourke isn't running as a slightly-less conservative version of Cruz, who is often described as the Senate's most right-wing member. Instead, O'Rourke's policy positions would easily align with California or New York voters; he supports marriage equality, abortion rights, gun control, and citizenship for immigrants brough to the U.S. as children. Sure, 2018 is supposed to be the year of the Blue Wave, but it's still no easy feat selling a Texas candidate with a 100 percent rating from Planned Parenthood. An army of dedicated volunteers and campaign workers, many in their 20s and 30s, are working to put O'Rourke over the top. 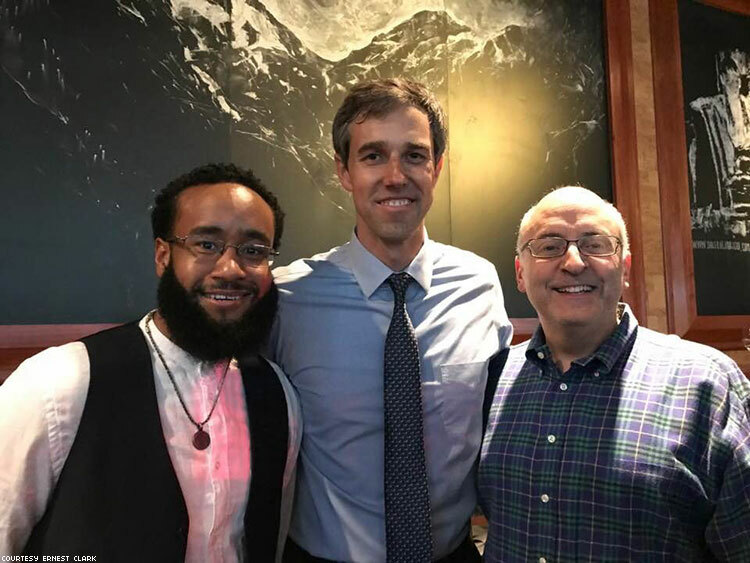 One of those people is Ernest Clark, O'Rourke's political outreach director, who just happens to be a 30-year-old African-American gay man. 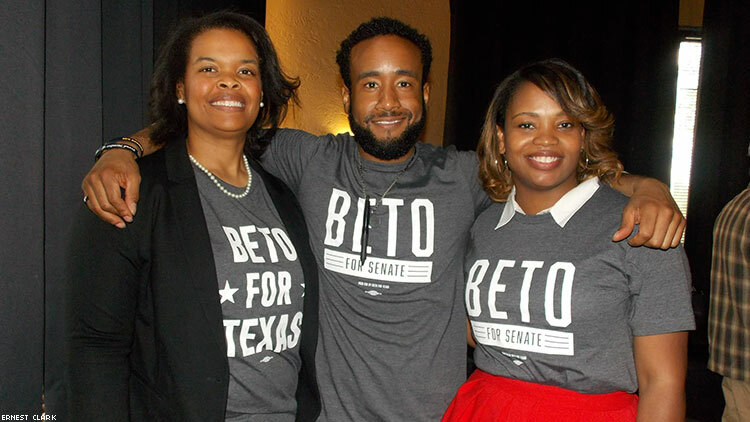 A community organizer from the Dallas suburb of DeSoto, Clark says he was drawn to join O'Rourke's team because of the congressman's positions and authenticity. "[O'Rourke] isn't out there touring 250 counties only because he's trying to get the vote," Clark says. "He's actually listening to the stories being told, which is something you don't see often, mostly in Texas, because it's gerrymandered to where most politicians will only target certain voters." Part of Clark's strategy is fanning out across expansive Texas — O'Rourke has literally been to all 254 of the state's counties — and making appeals for more well-paying jobs, funding for education, and health care for everyone. O'Rourke's message of working for Texans, not corporations or the 1 percent, is being made to both Democrats and Republicans — and the latter group is receptive. "The message is not red or blue, it's not Democrats win or Republicans win; it's we all win together," Clark says. "There's never been a town hall that's gotten accusatory or ugly, it's always so positive and you leave feeling so hopeful about Texas." Many voters have expressed gratitude to Clark and O'Rourke for coming to their city, with many saying they've never had a candidate hold a rally or meet-and-greet in their hometown. "It comes back to refusing to never write anybody off, or take anybody for granted," Clark says. O'Rourke is expected to easily win over cities like Austin, Dallas, and Houston, but Clark is optimistic about places like Lubbock, which Cruz handily won over Democrat Paul Sadler six years ago. "When we first went to Lubbock, we had a meeting around a table at a coffee shop and we weren't sure which table it was because there were only a couple people around it," Clark describes. "The last time we went to Lubbock, our sixth time there, we had 1,000 people in a ballroom." When visiting smaller cities like Lubbock, "I had a lot of stereotypes in mind," Clark says. But he describes the audiences as welcoming, saying it's "getting better" in Texas for black gays like himself. In the Dallas area, "you can live outside of the fear of being toyed or messed with." Clark says the road is much rougher for black trans people in the state and calls Minister Carmarion Anderson, the executive director of Black Transwomen, Inc., a hero and mentor. Anderson and other trans leaders in Texas have opened Clark's eyes about the unrelenting violence they regularly face. "People being hunted down and killed, that's something I know I can't stand for and I do my best to advocate for them, but I know one voice isn't enough," Clark says. O'Rourke has loudly declared his support for trans issues, telling a group of young people in April that, "I will fight for you." Can a candidate who makes announcements like that ever hope to win in Texas, a place that hasn't elected a statewide Democrat since 1994? "I wouldn't be on the campaign if I wasn't optimistic about the campaign," Clark says. "[O'Rourke] is bringing hope to people. This is our chance. This is our moment."